The Third Annual National Conference on Urban Resilience to Climate Change is expected to bring together experts, practitioners and policy makers to discuss a range of issues related to urban resilience and climate change adaptation. 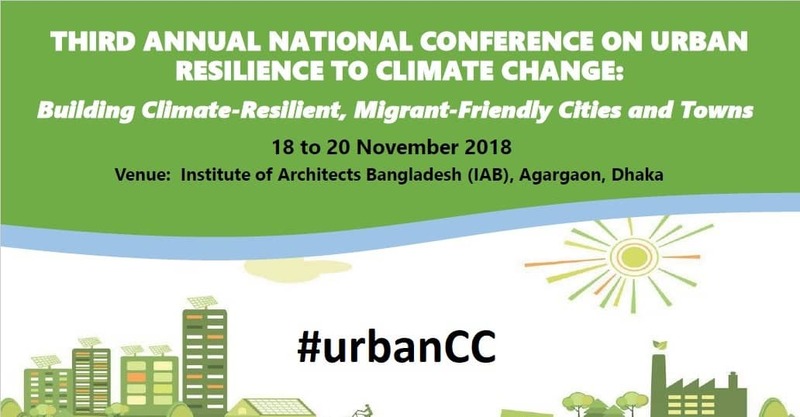 The conference hope to draw attention on how to make cities climate resilient and migrant friendly and how to accommodate the sustainable development goals (SDGs), its governance and collaboration, resources management and climate resilient and migrant friendly infrastructure. Jointly organized by the International Centre for Climate Change and Development (ICCCAD), Bangladesh Centre for Advanced Studies (BCAS) and the Asian Cities Climate Change Resilience Network (ACCCRN), the event will focus on the latest developments in urban resilience policies and practices, challenges and opportunities, and the way forward for cities in Bangladesh to be climate resilient. The conference will provide a befitting platform for participants to network, and build new partnerships to exchange ideas and best practices. Approximately 500 participants including government officials; academics, researchers and students; private sectors and NGO representatives; urban and regional planners; water and sanitation specialists; civil engineers; disaster risk and emergency managers; and climate change and adaptation experts are expected to join the conference.